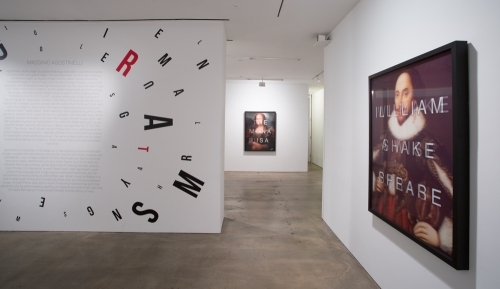 London-based artist Massimo Agostinelli’s new show of work “Anagrams” is currently on view at Hoerle-Guggenheim gallery in New York (open through November 11). The show includes works done with lenticular printing, so that names and phrases overlaid on imagery of pop culture icons transform as a viewer moves around them. An image of Clint Eastwood, says “Clint Eastwood” from one angle, and “Old West Action” from another. Or a picture of Elvis says “Elvis” from side, and “Lives” on the other. Agostinelli’s clever word play with anagrams is a continuation of his interest in using text, following an earlier series of palindromes. Whitewall spoke with the artist about this new body of work, and how his obsession with lenticular objects all started with a Wayne Gretzky trading card. WHITEWALL: When did you first become interested in using lenticular printing in your work? MASSIMO AGOSTINELLI: As a child I had an extensive hockey card collection and my most coveted card was a signed Wayne Gretzky, limited-edition lenticular card that I still have to this day. I also had a ruler in my pencil case and even a Pog collection with the lenticular effect imprinted on them. To me it was something very special and unique that captivated my imagination and attention, which was rare. I was honestly quite fascinated by its depth and multifaceted nature. To hold something that could transform before my very eyes without the use of electricity…it was like magic before my eyes. I then saved up to buy a Michael Jordan poster which had this very same lenticular effect showing the movement of his jumping movement and I took it upon myself to draw all my favorite Looney Tunescharacters (inspired by the Space Jam movie of course) and then I realized this medium was something I could continue to experiment with and here we are today! WW: Was there a particular staring point for the series in this exhibition? MA: Word play and text art have generally always been a predominately central theme in my work and from my previous series entitled “Palindromes” I felt that this (“Anagrams”) was simply a natural progression given the process I was working toward at my studio. Anagrams are essentially hidden messages that need to be decided in order to decipher a deeper meaning. Coupled with my adoration of iconic pop culture, I knew I had to pay tribute to those who influenced my development from an early age which had a big impact on my overall inspiration. However, this is only the very start of this journey. Soon I will be releasing a different series of “Anagrams” which I’m very excited about. WW: With the works in this show, as a viewer walks around them, a name like “James Dean” will turn into “Made Jeans.” You also have works show imagery of Clint Eastwood, Elivs, Queen Victoria, and even the statue of liberty. Were their any pop culture subjects you wanted to use but the anagram option didn’t make sense? MA: Yes, I wanted to use “Agostinelli” but felt that “Gasoline Lit” and “Agonise till” we’re not exactly that appropriate! Although, having said that, all my teachers in each of the 14 schools I’ve attended all claimed that I had a highly “flammable” character, which was indeed somewhat “agonizing” for them to deal with (hence the 14 schools). So in that respect,t I suppose it does actually work…but then again who the hell am I!? WW: Aside from their name’s ability to create an anagram, what interests you in the pop culture icons you chose to include in this show? MA: The icons which have been selected thankfully need no introduction. They’re so revered and important to me that I knew each and every one was something powerful enough to resonate, not only with my generation or prior generations, but especially all those to come. There’s nothing more important than remembering to commemorate those who made their mark on history for the greater good of humanity and above all our planet earth, which is our eternal path and respecting that fact is key to understanding our place. WW: How did you select the image, as each person or icon is so famous there must have been so many to choose from? MA: For me, the most important step was making sure I protected my ideas and my overall concepts, which is why I spent a great deal of time and money with my legal firm Mathias Squire in London, securing copyrights and trademarks for everything. When executing a project of this caliber, it’s important to ensure each and every aspect is completely covered, which is why all rights have been reserved. Choosing imagery is never straightforward and each and every step takes time but above all an extreme level of attention to detail.